Knowledge of Buddhism has come through three main channels: Western scholars; the work of philosophers, writers and artists; and the arrival of Asian immigrants who have brought various forms of Buddhism with them to Europe, North America and Australia. The 'come and see for yourself' attitude of Buddhism attracts many Westerners. They are not asked to believe in anything, but to follow the Buddha's advice of testing ideas first. With the growth of easy travel and communications, the West has been able to find out more about Buddhism in this century than in all the time before. 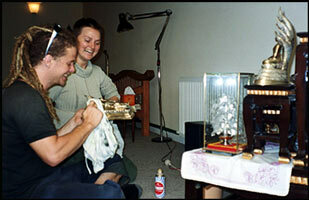 The informality and emphasis on practice of Buddhism appeals to many Westerners. A group of Buddhist practitioners at the conclusion of a 10-day meditation retreat at in the Blue Mountains Insight Meditation Centre, Australia. Buddhist attitudes of peace, mindfulness and care for all living creatures have come to be the concern of many groups in the West. Buddhist believe that all things should be looked after: the earth, plants, birds, insects and animals. This is close to the feeling among many people in recent years that the human race should stop polluting the atmosphere and destroying the surface of the earth by cutting down forests. Although the Buddha's teachings have been known in countries throughout Asia for over 2,500 years, very few people in Europe or America would have known what the word 'Buddhist' meant unless they had been born in the last 50 years. Over a century ago people from France, the Netherlands, Great Britain, and other European countries began to travel in the Far East. Many of them returned with Eastern ideas, and so Europeans began to hear about Buddhism. More recently, Buddhist people have moved to the West. Many of them have been refugees from conflict. Many Tibetans, for example, fled from their country after the Chinese takeover in 1959. The wars in Indochina in the 1950s and 1960s led many Vietnamese people to move to and settle in Europe, Australia and America. Other Buddhists from countries such as Thailand have established businesses in the larger Western cities. They have all brought their Buddhist beliefs to their new homes, and helped to set up Buddhist centres. 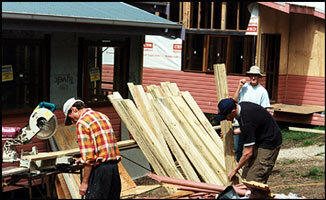 which are usually built with the help of volunteer labour. In the eighteenth century onwards, a number of Buddhist texts were brought to Europe by people who had visited the colonies in the East. These texts aroused the interest of some European scholars who then began to study them. Around the middle of the nineteenth century, a few Buddhist texts were translated into European languages. Thus Buddhist teaching came to be known to the European scholars. A few of them who were influenced by Buddhism, introduced Buddhist ideas into their own writings. Later, more and better European translations of Buddhist texts were made by the early part of the twentieth century, a large number of Buddhist texts had already been translated into English, French and German. This includes virtually the entire collection of Theravada scriptures as well as a number of important Mahayana texts. Before the beginning of the twentieth century, the study of Buddhism was confined mainly to scholars and there was not much practice of the teachings. Later, this pattern began to change. A number of Europeans felt that merely reading about Buddhism was not enough, so they travelled to the East to acquire firsthand knowledge of the Buddhist practices and to experience the monastic life. In addition, Buddhist organisations were founded in the major cities of Europe. One of these, the Buddhist Society of London, was established in 1924. It is the oldest and one of the largest Buddhist organisations in Europe. These organisations helped the growth of interest in Buddhism through their meditation sessions, lectures and circulation of Buddhist literature. By the early part of the twentieth century, a number of the Europeans, who had travelled to the East to study Buddhism, had returned. Some of them had become monks and they inspired and strengthened the Buddhist circles in Europe. They were soon joined by Buddhist monks from Sri Lanka and other Buddhist countries in Asia. In recent years, there has been a marked growth of interest in Buddhism in Europe. The membership of existing Buddhist societies has increased and many new Buddhist centres have been established. Their members include large numbers of professionals and scholars. Today, the major Buddhist traditions of Asia such as Theravada, Pure Land, Ch'an (or Zen), Vajrayana and Nichiren Shoshu, have a sizeable number of followers in Europe. images in the shrine room. As in Europe, scholars in America became acquainted with a number of Buddhist ideas in the nineteenth century. Some of the oldest universities in America had departments of oriental studies where scholars studied Buddhist texts. During the second half of the nineteenth century, Chinese immigrants settled in Hawaii and California. These immigrants brought a number of Mahayana Buddhist practices with them and built numerous temples. The Japanese Buddhist immigrant who arrived later, not only built temples but also invited over to America, the Japanese monks who belonged to the various Mahayana Buddhist sects. However, Buddhist activities remained largely confined to these immigrant communities. At the end of the nineteenth century, two outstanding Buddhist spokesmen, Dharmapala from Sri Lanka and Soyen Shaku, a Zen master from Japan, attended the World Parliament of Religions in Chicago. Their inspiring speeches on Buddhism impressed their audience and helped to establish a foothold for the Theravada and Zen Buddhist traditions in America. During this period, the Theosophical Society, which teaches the unity of all religions, also helped to spread some elements of Buddhist teachings in America. It was not until the second half of the twentieth century that Buddhist ideas reached a wider section of the American society. American servicemen returning from East Asia after the Second World War and Korean War, brought with them an interest in Asian culture which included Nichiren Shoshu and Zen Buddhism. The latter gained considerable popularity in the nineteen-sixties among literary and artistic groups in America and this helped to popularise Buddhism. When Tibetan refugees began arriving in America after 1959, they brought with them Vajrayana Buddhism. Soon it gained a substantial following there. During the postwar period, academic interest grew. Many new departments of Buddhist studies were established in the American universities. The basis of Buddhist practice in the West, as in the East, is meditation, and people may sit on cushions with their legs folded and hands in their laps. 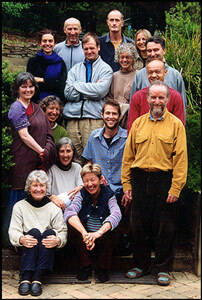 The photograph on the left was taken during a ten-day retreat at the Blue Mountains Insight Meditation Centre, Australia, with a western monk as the Teacher. Some groups will also do some chanting, and make offerings to the Buddha image in its shrine. A Theravadin group will be very quiet and peaceful. They may form themselves into lines to give food to the monks in the morning and expect to hear a talk during the day. A Tibetan group can be more active, chanting, asking questions and ringing bells. Japanese Zen groups are more restrained and spend a lot of time in meditation or zazen. 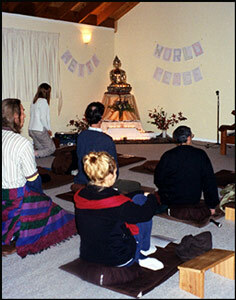 The activities at Buddhist centres allow people to find ways of understanding Buddhism. Today, there exist numerous Buddhist centres spread across Australia, New Zealand, Europe, North and South America. Virtually all the major Buddhist traditions are represented and continue to attract the interest of Westerners in all walks of life.